To discuss strategies to avoid, identify and deal with both minor and major complications, as well as indications for revision sinus surgery. Complication rates from endoscopic sinus surgery are low and have improved with increased surgical experience and new technology. Early extensive surgery in patients with complex sinonasal disease can improve long-term outcomes. A majority of patients undergoing endoscopic sinus surgery have a positive outcome. The surgeon must be competent in recognising and dealing with potential complications, as well as approaching complex revision cases. Functional endoscopic sinus surgery (FESS) is one of the commonest procedures performed by a rhinologist. Over 250,000 FESS cases are performed annually in the USA alone, the majority for chronic rhinosinusitis with or without nasal polyposis . Complication rates have reduced as training, experience and comfort with endoscopes and powered instruments have increased. In experienced hands, minor complication rates of 5% and major complication rates below 1% are cited [2, 3, 4]. While the majority of patients undergoing FESS will require a single operation, 10–19% of patients will require revision surgery [5, 6, 7]. We discuss strategies to avoid, identify and deal with both minor and major complications, as well as indications for revision sinus surgery. The FESS surgeon must have an intricate understanding of sinonasal anatomy, including potential physiological and pathological variations. This knowledge can then be applied to the individual patient’s pathology. High-resolution computed tomography (CT) of the paranasal sinuses with triplanar reconstructions is accepted as the minimum standard for visualisation of sinonasal disease. The CLOSE mnemonic is a well-known adjunct (Table 1, reprinted with permission from ) for assessing CT scans for potential surgical pitfalls . Nevertheless, the surgeon must be prepared to encounter unexpected pathology during surgery, especially if there has been a delay between the CT scan and FESS . As with all surgical skills, there is a “learning curve” associated with FESS. The FESS surgeon should be competent with undertaking emergency procedures to stabilise patients and rectify acute complications such as intra-orbital haematoma. Trainees should participate in cadaveric dissection courses and then perform diagnostic endoscopic procedures, allowing them to become comfortable with the endoscope, camera, orientation within the nasal cavity and three-dimensional interpretation of two-dimensional live images. The first 100 procedures performed by solo inexperienced surgeons generally have a higher complication rate . Studies have shown that, when performed in a training environment under guidance of an experienced FESS surgeon, there is no increase in complication rate during the learning curve period [2, 3]. A thorough pre-operative history will alert the surgeon of potential increased bleeding risks. Anti-coagulants should be stopped with an appropriate time interval to allow clotting to normalise. Haematological advice should be sought when bridging heparinisation may be required. Patients with known bleeding disorders should be managed according to protocols agreed with the haematology team. Beware of patients using over-the-counter vitamins and herbal therapies as these can impact on the clotting time. Careful insertion of the Hopkins rigid endoscope and instruments will minimise mucosal trauma. Localised superficial bleeding can be controlled with topical epinephrine-soaked patties, reserving bipolar cautery for refractory bleeds. Hypotensive total intravenous anaesthesia (TIVA) provides a clearer surgical field with less bleeding compared with gaseous anaesthetic agents . The post-operative removal of nasal packing is very distressing for the patient and causes unnecessary trauma to the mucosal lining. Dissolving nasal packs show some evidence of reducing post-operative adhesions ; despite a general subjective feeling that they reduce post-operative bleeding, this is not backed up by a recent systematic review . The sphenopalatine artery, or a branch of, may be traumatised at its point of exit from the sphenopalatine foramen during posterior enlargement of the middle meatal antrostomy, or at its septal branch during inferior enlargement of the sphenoidotomy (Fig. 1). The surgeon should be comfortable performing endoscopic ligation or bipolar cauterisation of this vessel if required. A submucosal elevation of the mucosa on face of sphenoid before enlarging the bony antrostomy can prevent damage to the septal branch. Orbital haematoma from anterior ethmoidal artery (AEA) damage during FESS is rare, with an incidence of 0.3% . The AEA may be within the canalis orbitocranialis in the skull base, caudal to the skull base in 60% of cases or dehiscent in up to 40% [14, 15, 16] (Fig. 2). An avulsed AEA may retract into the orbital cavity, presenting with severe rapid proptosis and a firm eye. It is therefore advisable to always use cutting instruments in the ethmoid roof. Immediate management with endoscopic medial orbital decompression or lateral canthotomy or a combination is required to prevent optic nerve ischaemia and loss of vision . Delayed-onset post-operative AEA bleeding typically presents in the recovery suite, possibly with lid bruising and ecchymosis before development of proptosis (Fig. 3). With less than 60 min before irreversible retinal ganglion neurodegeneration , urgent decompression by way of lateral canthotomy in the recovery suite may be required. The patient may then be returned to the operating room for formal endoscopic medial decompression if required. Damage to the internal carotid artery (ICA) with standard FESS is vanishingly rare, with an incidence historically quoted as 0.3% but commonly accepted as much lower with improved surgeon experience, CT scan quality and higher resolution endoscopy . The cavernous segment of the ICA is at risk during sphenoidotomy due to its relationship with the lateral wall of the sphenoid sinus. 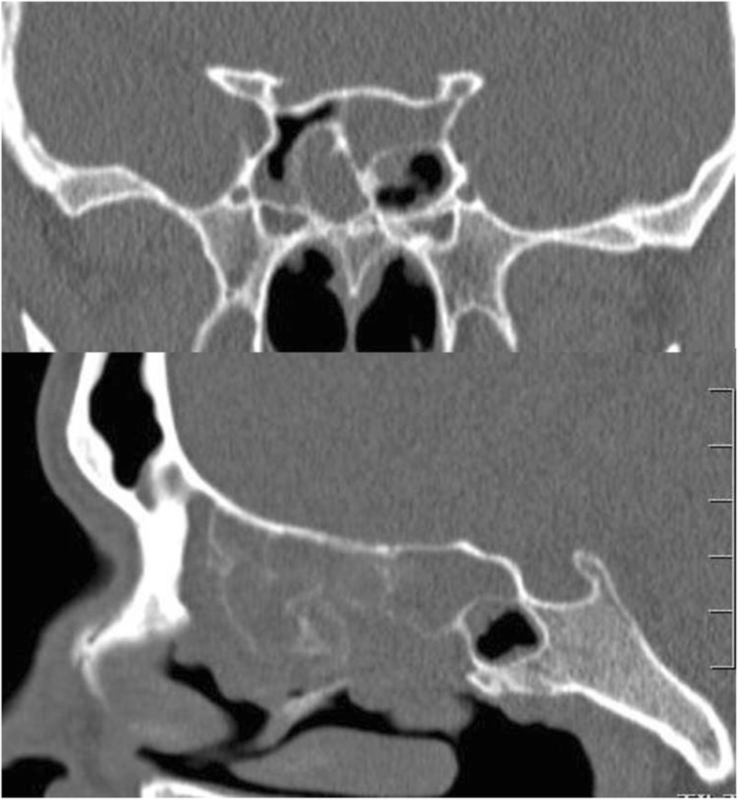 The ICA may protrude significantly into the sphenoid sinus in 15% of cases; the overlying bone may be thin in 20%, and dehiscent in 15% of cases; 1% of patients may have an intersinus septation connecting with the ICA . Sphenoethmoidal (Onodi) cells may be present in up to 40% of patients ; the ICA may be dehiscent within this cell and therefore at risk of damage (Fig. 4). Endoscopic skull base surgery (ESBS) necessitates greater exposure of the ventral and anterior skull base, increasing the risk of ICA injury; thankfully, in experienced hands, the incidence of ICA injury in ESBS is below 1% . Pre-operative contrast CT and MRI angiography allow appreciation of variations in ICA pathways and distortion due to surrounding or invading mass lesions . The ICA can be damaged at any point along its path, although the left cavernous segment is still most at risk . Should an ICA injury occur, the surgeon should gain immediate local control with direct pressure, utilise suction and irrigation to clear the surgical field, gain proximal and distal control (extending the dissection if required) and then assess the ICA injury to determine salvage options. Sheep model experiments have shown crushed muscle patch or use of an aneurysm clip to be effective measures for controlling acute ICA injury . It should be borne in mind that over 80% of patients will tolerate ICA sacrifice . Inability to control bleeding should be managed by balloon occlusion and immediate angiography. Following acute management of an ICA injury, post-operative angiography is mandatory. Residual active bleeding or formation of a pseudoaneurysm is an indication for endovascular management by interventional radiology or vascular teams. Damage to intraocular contents is thankfully incredibly rare. A large single-centre review  found the right eye to be at greater risk than the left, possibly due to the majority of surgeons being right-handed. The medial rectus muscle was found to be the most commonly injured, leading to strabismus and diplopia; should this persist, medial orbital wall reconstruction and strabismus surgery may provide benefit. If orbital contents are exposed, it is advised not to instrument the orbital contents, though gentle bipolar to the prolapsing orbital fat can allow continued access to complete the procedure. Failure to differentiate orbital fat from intranasal contents, with continued microdebrider use, can lead to irreversible damage and complete loss of vision . The optic nerve may be dehiscent in the sphenoid sinus in 4% of cases, and sphenoethmoidal air cells may contain a dehiscent optic nerve as well as the ICA  (Fig. 4). The risk to the optic nerve can be reduced by careful study of pre-operative triplanar CT scans, looking for these anatomical variations. In case of inadvertent exposure of orbital contents, the patient should be advised to avoid blowing their nose for 2 weeks to reduce the chance of orbital emphysema. Any damage to orbital contents should be managed in conjunction with the ophthalmology team. The nasolacrimal duct may be dehiscent in up to 7% of patients . Aggressive removal of the uncinate bone with a back-biting instrument and anterior overenlargement of the middle meatal antrostomy may lead to excess bone removal in 3% of cases , and may damage the duct itself, leading to epiphora. In recalcitrant cases failing non-surgical ophthalmological intervention, dacrocystorhinostomy may be required. Cerebrospinal fluid (CSF) rhinorrhoea can be due to defects anywhere along the anterior and lateral skull base. 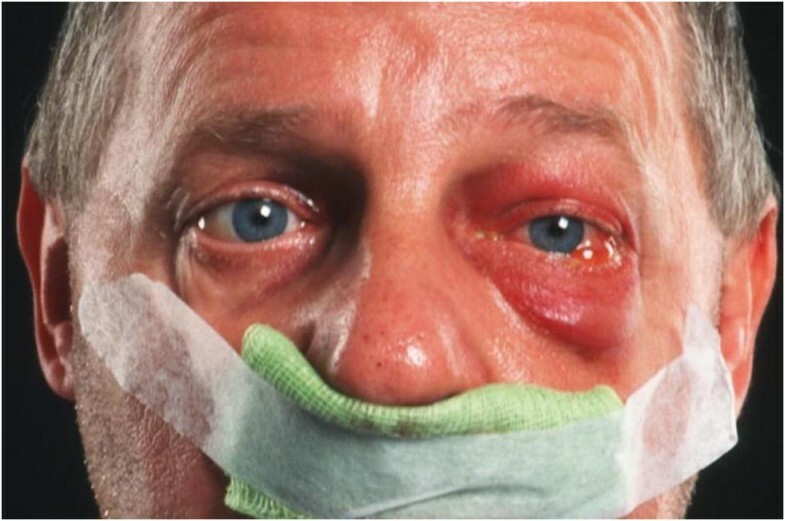 Lateral skull base CSF leak can present with CSF rhinorrhoea by passage via the Eustachian tube. Anterior skull base CSF leaks may be idiopathic, traumatic or iatrogenic; CSF leaks associated with standard FESS are rare, with an incidence of 0.2% , but may be due to both anatomical and technical factors . The extended skull base exposure with ESBS increases the incidence of CSF leak to 7% . 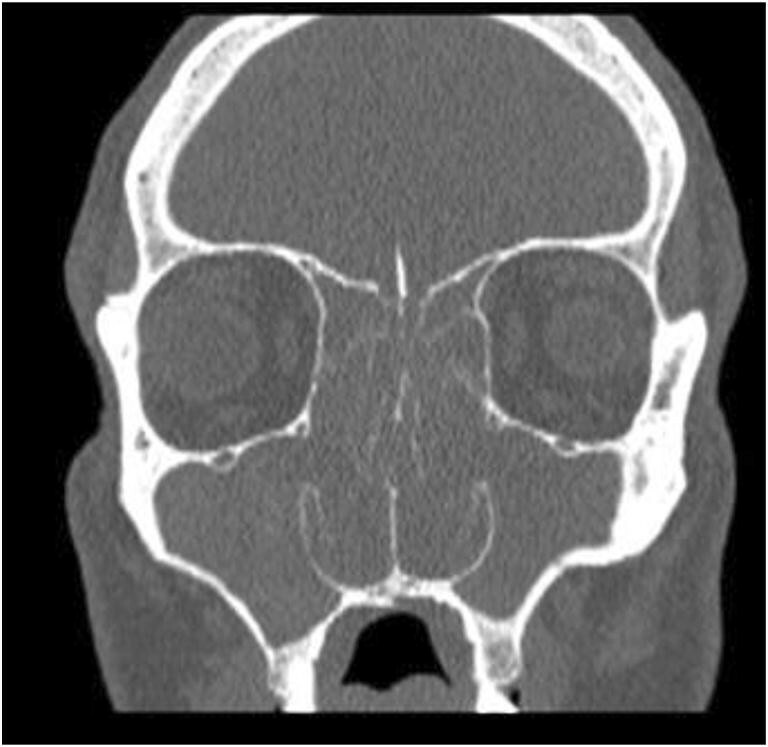 Common sites for anterior skull base defects are in the ethmoid and sphenoid sinuses [30, 31]. Recognising skull base damage and subsequent CSF leak during initial FESS allows concurrent repair; missed skull base damage may require additional surgical reparative procedures, adding to the patient’s morbidity and inpatient stay . Accurate diagnosis of the source and aetiology of a CSF leak is imperative in aiding surgical planning for repair. High-resolution CT is useful to locate bony defects in the skull base, and to rule out an otological cause. MRI and MR cisternography are useful in situations of multiple bony defects, or where the site of defect cannot be identified on CT ; CT cisternography may be reserved for cases where these have failed to identify a source. Intrathecal peri-operative fluorescein can be utilised in cases where all available imaging modalities have been exhausted . Multiple repair methods have been described. Accepted methods involve a three-layer approach to repair dura, substitute the bony defect and then to provide mucosal cover [34, 35, 36]. While a clean operative field is preferred, CSF leak repair may be carried out in patients with acute sinus infections or meningitis without added risk of complications . Post-FESS intracranial infections may present as meningitis, intracranial abscess or cavernous sinus thrombosis. The risk of meningitis with a persistent CSF leak is 19%, decreasing after repair of the skull base defect . Abscesses will require urgent neurosurgical drainage and therefore should be managed in the appropriate tertiary unit. All intracranial infections should be managed in a multidisciplinary environment, involving physicians, neurology and microbiology. Pneumocephalus is an uncommon complication of FESS. Tension pneumocephalus post-FESS is incredibly rare; only a handful of isolated cases have been described in the literature [39, 40, 41, 42]. All cases of pneumocephalus must be managed in conjunction with neurosurgical teams in a tertiary unit. While very small, uncomplicated cases may be managed with bed rest and administration of 100% oxygen; the majority will require surgical repair of the underlying bony defect . Tension pneumocephalus will require urgent surgical decompression along with repair of the defect to prevent brain herniation . As with all surgical interventions, the aim of FESS should be to provide appropriate resolution of pathology without recurrence of disease. Despite this admirable aim, the reality is that up to 20% of patients will require revision FESS within 5 years, 43% of which will be within the first post-operative year . A lack of anatomical and physiological understanding can increase the need for revision surgery . Risk factors for requirement of revision surgery are listed in Table 2 [6, 45, 46, 47]. Both the surgeon and patient should be aware that revision FESS carries an increased overall risk of complications and need for further revision surgery [48, 49, 50]. In patients with conditions known to have high recurrence rates, there is an argument for early, extensive surgical intervention . Aspirin-exacerbated respiratory disease is frequently associated with nasal polyps, a trio of disease known as Samter’s triad (Fig. 5). These patients typically have more severe nasal polyposis as compared with aspirin-tolerant patients . Recurrence rates post-FESS of up to 90% have been reported in this group . Indeed, the authors have managed patients previously treated at other units who have presented for their 18th FESS procedure. A low threshold for maxillary antrostomy, complete sphenoethmoidectomy and modified Lothrop procedure can reduce recurrence to 22.5% . The inverted papilloma, a subtype of Schneiderian papilloma, is a benign but locally aggressive tumour with malignant potential , commonly affecting the nose and paranasal sinuses. Increasing Krouse staging score  will necessarily require more extensive resection. Identification of the location of attachment and adequate resection reduce risk of recurrence . 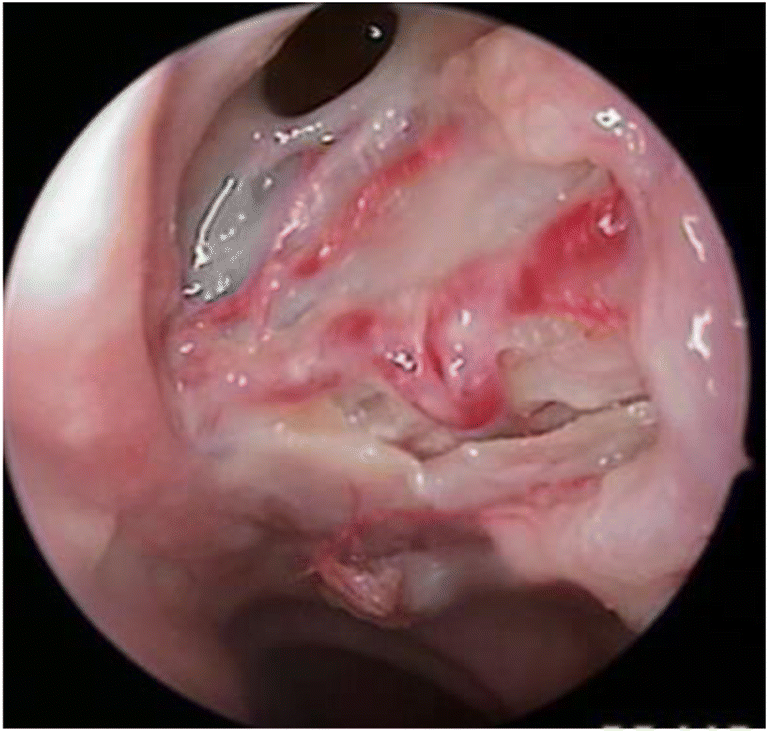 The importance of sending abnormal-looking tissue and nasal polyps for histopathological analysis cannot be overemphasised. Missed inverted papilloma can continue to progress in situ, presenting with complications including frontal pyoceles . Resection of frontal sinus inverted papilloma is associated with up to 37% incidence of mucocele formation; this is higher in combined endoscopic and open techniques than endoscopic alone [58, 59]. Obstruction of the frontal sinus outflow tract (FSOT) following FESS or EDCR can lead to the formation of frontal mucocele. 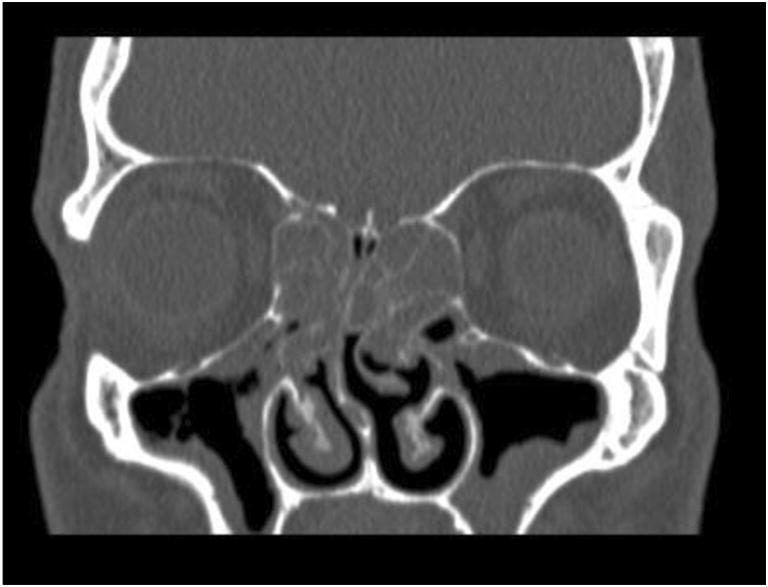 This may be due to adhesions or lateralisation of the middle turbinate , both of which can obstruct the FSOT. This may expand into the orbit or become infected leading to a pyocele and associated intracranial complications. The nasalisation technique, involving giant middle meatus antrostomy, middle turbinate resection, complete sphenoethmoidectomy and dissection of the FSOT cells, is associated with reduced incidence of recurrence but increased incidence of mucoceles; this can be reduced by preserving the horizontal portion of the basal lamella and the lateral insertion to the palatine bone . Adhesions post-FESS can cause nasal obstruction and recurrence of CRS, requiring revision FESS. Instillation of topical hyaluronic acid with hydroxyethyl starch or carboxymethylcellulose has been shown to reduce the incidence of post-operative adhesions [62, 63]. Atraumatic endoscopy and instrumentation techniques minimise the incidence of adhesions. The use of high-quality operating equipment assists the sinus surgeon with visualisation and instrumentation during FESS . The ever-increasing variety of two- and three-dimensional endoscopes, microdebriders and drills allow the surgeon to find the instrument he or she is most comfortable with. Image-guided navigation systems are useful adjuncts in revision FESS cases, where normal anatomical landmarks may be distorted or previously resected. 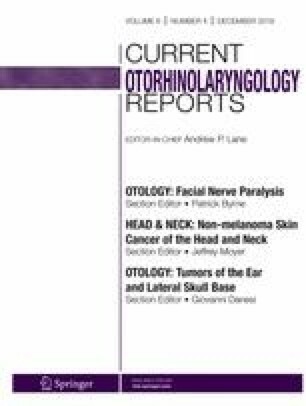 The American Association of Otolaryngology–Head and Neck Surgery advocates the use of navigation systems for advanced FESS, revision cases and tumour resection . A large meta-analysis has shown reduction in overall and major complication rates with the use of image-guided navigation during FESS . A majority of patients undergoing FESS have a positive outcome from a single operation, with no morbidity or recurrence. The FESS surgeon must be competent in recognising and dealing with potential complications, as well as approaching complex revision cases. American Academy of Otolaryngology - Head and Neck Surgery. AAO HNS position statement: intra-operative use of computer aided surgery [Internet]. Available from: http://www.entnet.org/content/intra-operative-use-computer-aided-surgery.